Back in 2001 or so, I got wind of eBay shops, tried it for a little while, and then gave up when it didn’t seem like I was getting many bites at all. At that stage in my development, I chocked it up to not having enough quality inventory nor much presence on the internet in general. The fees proved too much and I was simply not selling enough to cover the $15 a month bill. 8 years later I decided to try eBay shops again in December of last year. I had built up a decent inventory of art since my first try and had several communities and websites to my name to promote the shop at. eBay shops had improved much in my absence, such as a greater ability to organize your inventory, greater search engine compatibility, cross promotion capabilities, and the integration of Store search results with eBay’s main search page (which was one of its main failings previously). Another handy feature is the ability to export sales reports and integrate the eBay shop with organizational software. There are definitely a few more bells and whistles than it had during its infancy. In the three months I’ve used it, I’ve gotten a few inquiries on items, but never sales. I tried customizing my options with the Bold higlighting as well as the international listing option which allows my items to be seen by eBayers in the UK. I got plenty of views, but still no bites even with proper cross-promotion from my other websites. Meanwhile, the wracked up fees from listing my inventory and auctions plus the $15 for maintaining the shop produced a $30 drain per month rather than merely a $15. Add onto that the 12% commission eBay would take out of my final sales and you have a store that eats profits rather than creates them. The Bottom Line: eBay shops seems best suited for those of you who may be able to move items faster (ie. if you sell collectible items, cosplay, or other in-demand things), therefore making the monthly drain not so detrimental. The interface is customizable with lots of features, but the majority of your pageviews come from active Auctions and not standing inventory (at least in my experience with Shops). From my time with eBay Shops, it seems to me that to make a shop work successfully, you must keep both a regiment of active auctions and an in-demand inventory, something which is hard to do if your inventory is in less of a demand and you are not producing work for auction monthly. It is a good alternative if you can move items quickly and don’t want to deal with the headache of programming inventory pages yourself, but not recommended for those with slower high priced luxury inventory like fine art unless your name just has that much demand behind it and you have the budget to support the shop, while there are other shops online where you can find your favorite products, using coupons from sites as couponscollector.com so you can also have discounts in these products as well. For now, I’ve decided to focus on revamping my website store with the free shopping cart Mal-E, which integrates Paypal, Google Checkout, and other useful payment methods so that my website becomes the one stop shop for personalized items rather than eBay. I still plan to post eBay auctions at random per month to give people a chance at acquiring originals and commissions for less and to draw traffic to my website store, but my shop on eBay is closing indefinitely this time unless their fees decrease and their benefits increase. My website store isn’t completely finished yet, but here’s a sneak peek for the curious. I welcome any comments or suggestions you might have! I welcome any comments from those of you who have eBay shops that are actually operating at a profit. Please share your stories and advice! I’m heading off to New Orleans for a mini-vacation with Windfalcon and Girlanime so you may not see posts or replies from me till late next week. I hope to return with a video journal of the madness and sketches from our sojourn into the French Quarter’s cemeteries, mask shops, pubs, and corner markets. 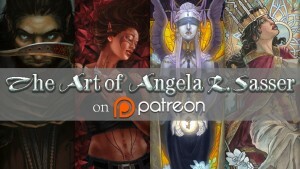 – The “Confessions” Series continues with a discussion of how to present your artwork. Is your artwork safe from your own bad habits? – Professional or Sellout? Prepare for a rant about this demeaning stereotype. – Introducing the Muses, allow me to introduce some of the characters that continually popup in my work. Till next time, keep your creative spirit strong! have you looked into etsy ? i avoided it earlier as the quality of work i saw there did not impress me but over the past year or so it has greatly improved ! they cater to those looking for ‘handmade’ items: jewelery, paintings, quilts etc. there is no cost for a store, listings are 20cents for a 4 month posting and i THINK their cut is 3-5% (?) i’ve done pretty well there with my hummingbird tutorial … you can find my etsy link on my blog if you want to get an idea or just drop me a note 🙂 have a WONDERFUL vacation ! ps: my other blog is now public if you are interested – gonna go to your website now. Thanks for the suggestion Nichol, even if I do already have Etsy, always good to get a vote of confidence for it from others! I’m still playing around with Etsy and have sold one or two things through there. Mainly, I am trying to cut down on requiring viewers to go on a scavenger hunt around the net to find my stuff. I will probably be making my Etsy purely for jewelry and masks in the near future so as to drive people to my website for signed prints and originals instead of sending them elsewhere. I gave up on ebay years ago, along with several other artists I know. Funny thing is, ebay was great for me in its starting days before it got too big. Now everything just gets lost there. I’m also using etsy though, but like you I prefer to keep my sales centralized. The only items I put up on etsy are things I make that I don’t want to actually keep a stock of, like random jewelry items that I can make one or two of and then never think about again unless someone requests. Stephanie, I remembered you saying this in a previous interview. The bubble of eBay does seem to have burst over the last few years. Seems you hit it at a really good time! It’s still a nice place to garner some outside traffic, but they really need to work on the effectiveness of shops for independent artists. Selling things less than $150 only works if you can mass produce art for that much, which sadly I don’t fall into that category most of the time. As for Etsy, I’m the same way. I don’t make the pendants all that often so its nice to have a place to dump them without having to manage the creation of the webpages myself. MissNox, thanks:) I’m glad it’s visually appealing!